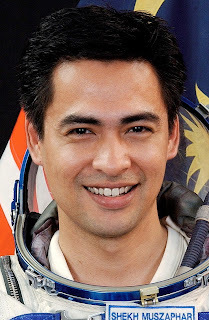 Here is a news story about the first Malaysian astronaut in space, Sheikh Muszaphar. Most of the headlines about his space trip have been about his challenges of praying in space. I had earlier lamented on the fact that the Malaysian space agency convened a two-day conference to resolve religious technical issues such as finding the direction to Mecca from space (yes they produced a whole book out of it). When money is tight, why not spend that money on holding a scientific conference instead. On the one hand I am annoyed by this (completely) unnecessary intrusion of religion into scientific affairs (ok - affairs related to space). On the other hand, it is clear that Muszaphar has indeed become a role model for millions of youngsters in the Muslim world and many may pursue scientific careers simply because of him. Of course, his image is finely tailored by the Malaysian government (not too different from the early US space program) - and praying in space is an issue that would get tremendous public support in Malaysia. Check out the video story below - and we can see the kind of impact he is having in Malaysia. Talking about image control, he is not allowed to marry for two years by contract with the Malaysian government! For my money, they should have gone with Bowie's "TVC15" instead. It annoys me greatly as well, but i suppose change comes gradually and it is a step towards scientific advancement. Hopefully this would be followed by an attitude of scientific thinking. If I am not mistaken, somebody wrote a phd thesis on finding the direction of kaaba in space. Now that is brilliant! Xoff: Actually the problem itself can be a good dissertation topic - with general applications to satellite communications etc (I'm pretty sure - these problems have been resolved as low-orbit satellites, the space shuttle and the space station communicate with fixed points on Earth - be it the cape Canaveral or the Houston). I just don't like limited resources being spent on conferences such as these. This item calls to mind that God was prominent in the US space program in the 1960s, though not in such an official capacity as the Malaysian case. First, there was the famous reading from Genesis during the Apollo 8 circumnavigation of the Moon in 1968. Thought had been given to reading the Christmas narrative from one of the Gospels, but Genesis was chosen instead as being not specifically Christian. Madeleine O’Hare sued the US government for the reading anyway, but was dismissed all the way up to the Supreme Court, which cited its “want of jurisdiction” without elaborating (http://caselaw.lp.findlaw.com/cgi-bin/getcase.pl?court=US&vol=397&invol=531&friend=nytimes). I don’t know enough law to guess whether they meant that extraterrestrial US government activities are not under its jurisdiction (a frivolous rationale, I would say -- doesn’t the Constitution hold for the US government abroad and on the high seas? ), or that alleged promotion of religion by NASA is somehow not under its jurisdiction (but I can’t understand that either). Hm. And then there is the fascinating case of Buzz Aldrin, who on page 233 of his 1973 autobiography Return to Earth describes how after Apollo 11’s Moon landing, before the first moon-walk, he served himself Communion. I don't know whether this rite has been carried out in space on any other occasion. Aldrin writes, “I had intended to read my communion passage back to earth, but at the last minute [astronaut] Deke Slayton had requested that I not do this.” -- because of the O’Hare lawsuit. Prayer in space thus has a bit of history. 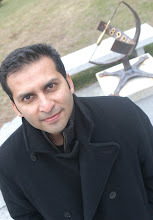 Space travel considered AS a religion, or quasi-religion, is also a fruitful topic (http://turnrow.ulm.edu/view.php?i=95&setcat=prose). That is some fascinating information - especially about the bit about Aldrin's communion. I think one of the Apollo astronauts also later became a priest/pastor - I forgot which one. But thanks for the info and for pointing out the parallels to the Malaysian case.